The other day Lori Clarke and I were discussing strategies for negotiating daily barriers to change. These barriers can be as obvious as physical pain or financial precariousness, as intangible as depression and anxiety, or as mundane as boredom and disengagement. We are creatures of habit. Our neurons love to fire along the same worn pathways and it can be extremely difficulty to lay down new patterns. We get stuck. We are both fortunate to be part of a group of artists working with choreographers Christopher House and Anne Troake on a dance project sponsored by Neighbourhood Dance Works. Christopher has been studying recently with seminal dance artist Deborah Hay, whose interest lies in dance as a means of exploring consciousness. Lori reminded me of one of the directives Chris brought us from Deborah - Turn your head. It's a deceptively simple action, but carries a powerful suggestion. When our gaze is constantly pointed in the same direction, we experience tunnel vision, limiting our opportunity to access and process new information. The act of turning your head immediately presents an altered perspective, both literally and symbolically. It is not to be confused with merely turning away from difficulty or averting your eyes from the unpleasant. I think of it more as a way to acknowledge difficulty and approach it from a different direction. It is a gentle reminder to challenge our point of view, an embodiment of the notion of change. We are not always in a position to make radical changes in our lives. No magic program or pill will make us happier, stronger or wiser overnight and I bristle when I hear people making such promises. But sometimes the smallest of actions can help rouse us from our reverie and see the world afresh. Give it a try. Ochre Pit Cove Methodist Church. Built in the 1880's. Photo taken 1919. Ochre Pit Cove United Church, built in 1938. Photo taken in 1967. Note the original bell tower was removed at some point and replaced with a peaked roof. Methodism arrived in Newfoundland in the form of Reverend Lawrence Coughlan, an Evangelical Anglican who came to Harbour Grace in 1766. With its small meeting structure, passionate revivalism and belief in personal salvation, the mission spoke strongly to impoverished fishermen and their families, who lived, essentially, in indentured servitude to the fish merchants. The sobriety and sense of community that accompanied conversion brought a new found pride to its adherents, much to the chagrin of the merchants who eyed any sort of self organization by the fishermen with suspicion. Regular meeting attendance, refraining from drinking, cards or dancing was required and many of the ruling class found themselves under censure by the Reverend for non-compliance. 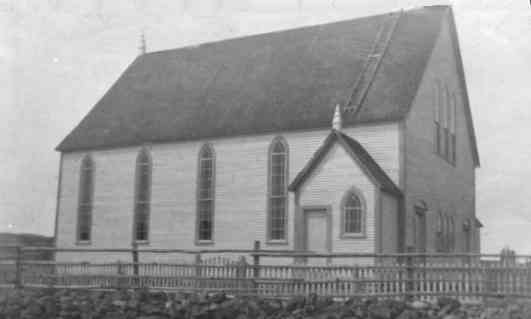 Coughlan was instrumental in the construction of a Methodist Church in Blackhead, Conception Bay in 1769, the first of its kind anywhere in Newfoundland or Canada. He returned to England in 1793, driven out after he refused to sanction a prominent merchant as a godfather on moral grounds. Still, the teaching continued to spread slowly, eventually developing a substantial presence in Conception Bay, Bonavista and St. John's. The first Methodist Church in Ochre Pit Cove was raised 1811, with another built in the 1880’s. In 1925 the Methodists in Canada joined with the Congregationalists and most of the Presbyterians to form the United Church of Canada. Newfoundland, although not a part of Canada at the time, joined them as well. Our building in Ochre Pit Cove was built in 1938. Over the years, the United Church veered away from the austere precepts of its evangelical predecessors, and has become known for its progressive and inclusive philosophy. I think they'd be okay with the odd game of cards, a glass good cheer and a bit of dancing - well, maybe a lot of dancing - that might happen at Ochre House today. 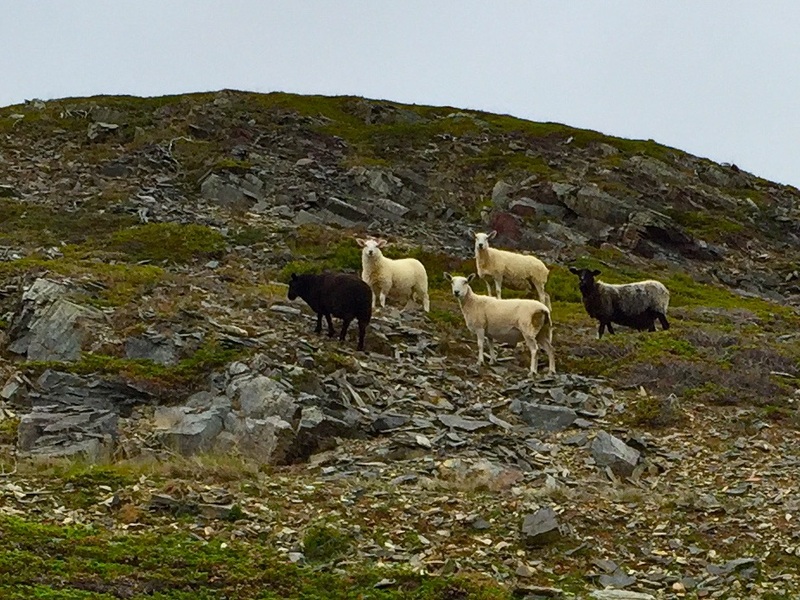 Hospitality marketing often talks about escaping or getting away from it all. Maybe we crave adventure, novelty and excitement or maybe we're just looking to relax and leave our worries behind. I wonder, though, if we really need to escape our lives, or if that's even possible. We carry our bodies with us wherever we go. We carry our thoughts and habits, our joys and sorrows. They are what make us tangly, complicated creatures. Life is a messy affair. Honestly, I believe we can make adventure in our own backyard if we want to. Every moment is inherently new, even if it doesn't always feel that way. Every time we breathe, we change. You don't need to come to here to do that. I'm a terrible marketer. If you do come, I hope you come not to escape, but just to be where you are. Take your messy self with you. Be open to your joys and patient with your sorrows. There's room enough for all of it. Welcome to Ochre House. Be here.